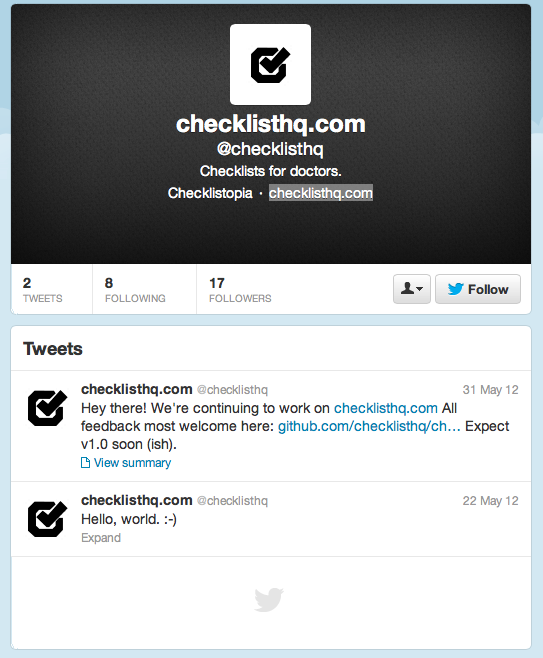 Do we really want to be encouraging Patients to ask ‘Doc, did you use this checklist?’? 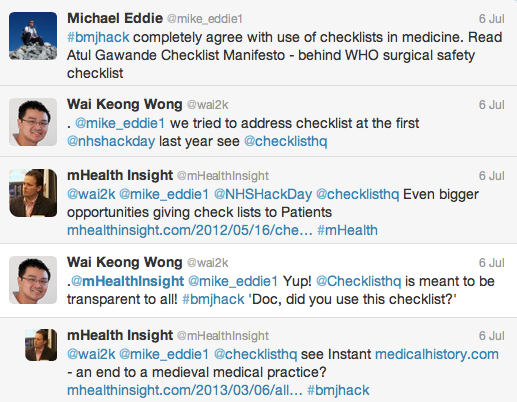 Following the #BMJHackDay tweets from this weekends BMJ Hack Day in London and I noticed a group working on the development of checklists for use by Doctors and from following some tweets I noticed there appeared to be an appetite for creating a scenario where Patients quiz their Doctors as to whether or not they used a certain checklist. 1) Having experienced medical professionals entering structured data into computers has been proven to be a colossal waste of time and resources. Thousands of Medical Professionals now talk to their computers so we must plan to move on from this dated way of thinking. 2) We already have clinically validated tools that can enable Patients to help their Doctors with the documentation of their own care. We must use the tools of our time and be prepared to let Patients help. 3) We already have initiatives to encourage Patients to challenge their carers about their hand wash status (eg. ‘Doc, did you wash your hands?’) but I feel this is very different as unlike handwashing status ‘did you use this checklist’ won’t lead to a simple binary answer to which the Patient can easily reply (eg. “Thanks!” or “Would you awfully mind washing your hands for me?”). Questionning an experienced Doctor about whether or not they have done something that the vast majority of them haven’t been trained to do and for which the evidence base isn’t clear could also do more to break down the Doctor/Patient relationship than it may ever contribute. Imagine if all 400 passengers of a Jumbo Jet insisted on personally asking the pilot if he’d done all his preflight checks and you’ll get idea of how challenging this would be to put in place (for one thing passenger check-in would take 4 days once you take into account rules surrounding pilot rest requirements!). a) Doctors aren’t always going to be comfortable using someone else’s checklist. b) Most Doctors will want to see the clinical validation that shows your checklist will be effective with their Patients before they’ll even consider using it. c) Doctors will want to be sure that their medicolegal insurer is comfortable with them using your checklist with their Patients. d) Most Doctors work for institutions that will want to develop their own checklists so they’ll reject anything you produce because it’s NIH (Not Invented Here!) and many will think little of plagiarising any checklists you’ve created and not giving any attribution to you for all your hard work. 2 Responses to Do we really want to be encouraging Patients to ask ‘Doc, did you use this checklist?’? I’m currently a medical student at a major research institution and we use checklists all the time. Not only are they great for getting comprehensive documentation, but also useful for future retrospective studies. Do you provide Patients/Carers with access to these checklists? Do you provide documentation to Patients of the care you are providing to them?